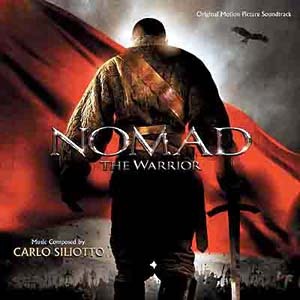 When Italian composer Carlo Siliotto was nominated for a Golden Globe for his score for Nomad, the film music world let out a collective “huh?” The film had not yet played in cinemas in the United States; a large majority had not even HEARD of the film, let alone seen it or heard its score; and Carlo Siliotto is not a composer many people would list as being a regular awards contender. The utterly amazing thing, though, is that the Hollywood Foreign Press got it absolutely right. Nomad is stunningly good score, full of rich themes and ethnic mystery, which undoubtedly would have gone on to greater acclaim had its accompanying movie not been so comparatively obscure. Nomad is a story about Kazakhstan; not the backward nation lampooned so successfully and mercilessly by Borat, but the actual historical nation, which has a depth of culture that can rival some of the greatest epics ever portrayed on the silver screen, and whose national heroes are the stuff of legend. The film is directed by Sergei Bodrov, Ivan Passer and Talget Temenov, and tells the epic story of Erali, one of Kazakhstan’s greatest historical figures, who is to the Kazakhs what Genghis Khan is to the Mongols or what Taras Bulba is to the Ukrainians. Erali was born a commoner in the vast steppes which make up Kazakhstan’s sprawling interior, but who over the course of the his life discovers his destiny: to lead an army which will, eventually, unite the country’s three warring tribes under one flag, and forge the beginnings of what would eventually become one of the largest countries in the world. This huge, expansive action-drama stars American actors Jay Hernandez, Kuno Becker, Jason Scott Lee and Mark Dacascos, despite being filmed entirely in the Kazakh language. Carlo Siliotto isn’t a composer you hear much about. His two highest-profile outings in Hollywood to date have been the 1995 family movie Fluke, about a loving husband who is reincarnated as a dog, and the 2004 action movie remake The Punisher, which was based on the Marvel comic strip character, and which received surprisingly positive reviews for the music. His score for Nomad, though, could well go on to become one of the defining works of his international career. Written for a the massed ranks of the Bulgarian Symphony Orchestra, a varied chorus of singers both traditional and ethnic, and a large cache of traditional solo instruments from the region and performed by the Kazakh Kurmangazy Orchestra of Folk Instruments (including jaw harps, Iranian shehnai oboes, and traditional Kazakh kobyz cellos and dombra lutes), the score is broad in scope and wide of canvas, encompassing sweeping romantic themes, luxurious passages depicting the majestic Kazakh landscape, and dense action material filled with extravagant percussion and menacing vocals. The opening “Kazakhstan 1710” set out the stall early with a noble performance of the stirring main theme, led by the evocative shehnai, accompanied by fluttering dombras, and featuring menacing-sounding throat singers, most likely from the neighboring Russian republic of Tuva, which is famous for them. The main theme is strong and memorable, and appears regularly throughout the rest of the score, in cues such as “The Baby Rescued”, the stirring “Oraz Tells the History”, and the brutal “The Duel”, which emerges from a tumultuous opening half into a spellbinding, enormous performance. The conclusive pair, “Kazakh Victory” and “Nomad”, swell to stirring proportions, and give the score a fitting sense of noble finality. Other notable moments include the noble-sounding “A Horse for the Khan”, the light and playful “Save Your Son” which counterpoints the main theme against dancing woodwinds and light metal percussion, and the gorgeous cello elements in “Looking for the Child”, “Her Eyes, Her Voice” and “You Are Still My Brother”. “1000 Fires” is an improvisation on an old Kazakh folk melody by vocalist Aytkhali Zhaimov, while the actual final cue, also called “Nomad” is a performance of the main theme solely by the folk orchestra. Unexpectedly, the curiously dreamy “The Scarf” contains a melody which sounds a lot like a kind of Central Asian variation on the British lullaby ‘Hush Little Baby”. The action music, which accompanies the numerous vast battles between the warring tribes, is remarkably dense and powerful, and is anchored mainly by the brass section. A vaguely Slavic-sounding three-note motif for horns regularly appears as a calling card in cues such as “Jungar Encampment”, “Amen” and the heroically upbeat, stylistically diverse “Gaukhar Rescues Mansur”, while conversely the likes of “Gaukhar Captured”, “Tied to Pole” and “Torture” seethe with percussive anger, and see Siliotto putting his drummers through a thorough workout. Something very appealing about the way Siliotto uses the ethnic instrumentation is that he doesn’t just use them for colour – in many cues, notably the opening “Kazakhstan 1710”, and later in “Orders from the Khan”, he actually uses the shehnai to carry the melody of the theme. It’s something that James Horner did with the shakuhachi in scores like Willow, and which Bruce Smeaton did with even more success in the excellent but under-rated Iceman, and even though the performance is not smooth and the comfort range of the instrument is sometimes exceeded, the effect is one of genuine authenticity, and it makes the score all the more effective. It is also worth mentioning the way in which Siliotto layers the open-sounding vocals to superb effect, with traditional choirs on top of ethnic choirs on top of throat-singers, and the result is forceful and dramatic. In many cues, Siliotto actually seems to be using the throat singers in place of the traditional stringed double basses – a very clever touch – and allows them to bring a dark, emotional depth to the music, while the orchestra and the other vocalists ululate over the top. “Jungar Attack”, “Meeting Gaukhar” and “Mansur is Captured” showcase this unique layering technique in an action setting to excellent effect. Music composed, conducted an orchestrated by Carlo Siliotto. Performed by The Bulgarian Symphony Orchestra and the Kazakh Kurmangazy Orchestra of Folk Instruments. Featured musical soloists Zhanar Sabit, Mario Arcari, Christo Tanev, Dimitar Dancev, Erlan Sabitov, Talgat Mukyshev, Ersain Basykara, Asylibek Akhatov, Maksai Zhusupali and Marat Akhmetzhanov. Special vocal performances by Aytkhali Zhaimov, Patrizia Polla, Edil Kusainov, Ruslan Kara, Galinzhan Sekey and the Cosmic Voices of Bulgaria. Recorded and mixed by Marco Streccioni. Edited by Dave Tinsley. Album produced by Carlo Siliotto.